It’s free, it’ s powerful, it’s accessible to everyone, stretching is one of the simplest and most often overlooked tool when it comes to healing the body, reducing stress, and living active and pain free. In her new book author Julie Schoen discusses the basic principles of stretching and how to incorporate total-body stretches into your daily routine. Little Pearl Publishing launches Keep Calm and Stretch, the sister book to Keep Calm and Breathe, which offers the reader 44 stretches that promise to benefit both body and mind. It’s free, it’ s powerful, it’s accessible to everyone, stretching is one of the simplest and most often overlooked tool when it comes to healing the body, reducing stress, and living active and pain free. In her new book author Julie Schoen discusses the basic principles of stretching and how to incorporate total-body stretches into your daily routine. Keep Calm and Stretch, the sister book to Keep Calm and Breathe, offers the reader 44 stretches that promise to benefit both body and mind. As an experienced yoga instructor, Schoen and her students, some of who are well over 70-years-old, experience the benefits of stretching every day, claiming that it allows them to be more focused, more creative, and able to live day-to-day with little to no pain all while strengthening and lengthening their muscles. “Stretching,” says Schoen, “is very rarely talked about on its own anymore. Either you stretch in yoga class or you ignore it completely.” And for some people who might not be into the yoga scene, Schoen says that they are missing out on a great deal of benefits. 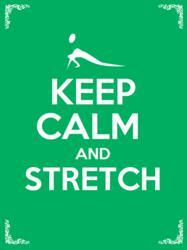 Filled with photo demonstrations and exceptional step-by-step instructions an experienced stretching professional can provide, Keep Calm and Stretch is one of the best books available for not only learning new stretches and how to properly do them, but also for answering questions like why a person who stretches regularly may not be getting more flexible. The answer, according to Schoen, is all about resistance and small muscle groups. Keep Calm and Stretch is available on Amazon and will be free all weekend for anyone curious to find out how stretching can transform their lives.